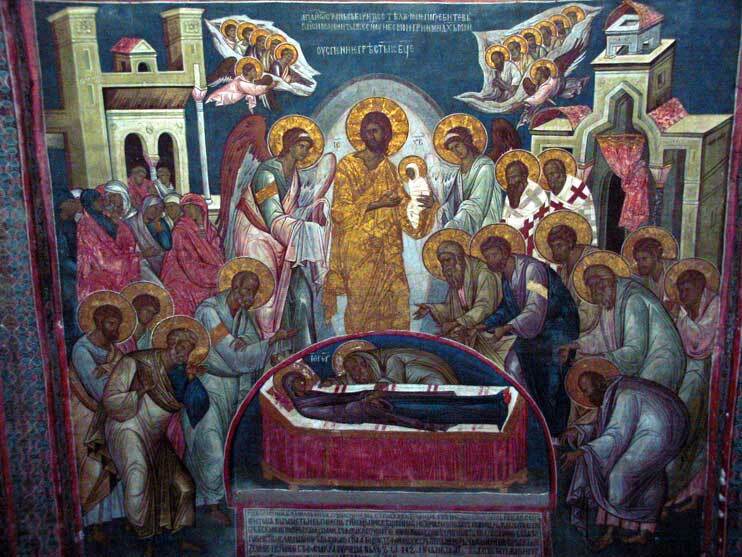 “Across one of the walls of Grachanitsa is shown the Falling Asleep of the Virgin Mary, the state which preceded her Assumption, a subject often treated by the Byzantines. There is no man living today who, exploring his mind in the light of that idea, could draw out so much. “In the foreground of the fresco is the Virgin lying on her bier. By the lax yet immutable line is rendered the marvel of death, the death which is more than the mere perishing of consciousness, which can strike where there is no consciousness and annul a tree, a flower, an ear of corn. Above her bier there shines a star of light; within it stands Christ, taking into his arms his mother’s soul in the likeness of a swaddled child. Their haloes make a peaceful pattern, the stamp of a super-imperial power, within the angles of the star. About them throngs a crowd of apostles and disciples, come hastily from the next world or from distant lands to attend the Virgin’s death, wearing their haloes as bubbling yet serene spheres. On the edge of the crowd stand some bishops in their cross-covered mantles, rock-like with the endurance of the Church, which cannot be perturbed by the most lacerating grief, and still others, also in flowing garments but with bodies liquid with grief, and others, also in flowing garments but with bodies tautened by effort, low under the weight of the bier. The background is full of angels as the Eastern Church loved to conceive them, ethereal messengers who are perpetually irradiated by the divine beauty and communicate its laws to flesh-bound man, a dream of perfect vision and unfrustrated will.